With its release of The Legend of Crystal Valley, (hereafter referred to as Legend) Cateia Games has delivered to gamers an opportunity for gentle exploration, quiet questing, and peaceful puzzle solving from a third-person perspective. Our heroine, Eve, embarks on a journey of discovery which evolves and stretches her perceptions and beliefs of reality, morality, and personal responsibility. As do the vast majority of adventure games, this one begins with an enigma. We see a shadowy candlelit room. A man stares intently at a photograph inscribed “To Daddy.” Writing hurriedly, he hands the paper to a somewhat oddly shaped servant. Lonely music accompanies echoing footsteps as this same man approaches a hexagonal metallic door. Silently it opens. He unhurriedly enters. The scene shifts to a rain-soaked graveyard. A young woman, red hair standing out in the gloom, kneels beside an imposing tombstone as a quiet voice reads aloud the words from a cryptic letter. These words will shake the foundations of her life, changing it forever. Who is this man? More importantly, where is this man? Why does this woman linger by a tomb? Should she answer the call of the letter? Can she follow the cryptic trail? Legend’s well-designed, flexible, customizable, intuitive interface (including separate adjustments for speech, sound effects, ambient sounds, and footsteps) makes it easy for us to try. Many functions can be accessed in a variety of ways, allowing the gamer to play according to her own preferences. For instance, you can access the scrolling inventory panel (which includes buttons for the Diary and Magic Spells as well Save, Load, and Main Menu) by right clicking, or through the tab on the upper right of the screen, or by a keyboard shortcut. Legend is entirely mouse controlled. You can save at will and name your own saves. In addition, the game auto-saves on exit and seems to have no limit to the number of saves possible. Cursor changes (magnifying glass, eye, hand) indicate which actions are possible. Eve can be hurried on her way with the space bar—an animation I always found amusing. A very helpful tutorial is included at the game’s beginning, but if you so choose, it can be skipped. 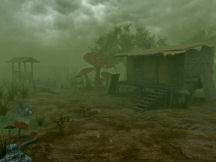 Legend is a game replete with non-player characters (NPCs). Eve interacts with a diverse cast including Elvis, a Romeo wannabe, giants, aliens, witches, robots, dwarves, and dragons. Most appear a bit blocky. Pointy noses and chins abound, giving them a “fairy tale” look, which suits the game well. Though their movements are bit mechanical, this did not detract from the game. In addition, they are a chatty bunch. Except for the introduction and tutorial, all dialogue is via captions. I expected the lack of voice acting to bother me, but found I actually liked it in this game. While the dialogue is often entertaining, it can be skipped and is automatically entered into Eve’s diary. References too numerous to count to games, popular icons, classical figures, fantasy movies -- both visual and spoken -- flourish. Part of the fun factor is trying to identify them all. The majority of NPCs need a favor or two from Eve. In return, they will provide items or information necessary to her search. Quite a few of the favors are of the fetch quest variety, though a few logic puzzles are included. There is one sound puzzle which also provides color cues. In addition, the necessary tones can be repeated at will. I found Legend’s challenges to fall in the easy-to-medium difficulty range, fitting well with the laid-back feel of the game. There are no mazes, mini-games, sliders or timed sequences. However, I do have a quibble with the implementation of one puzzle. For this particular puzzle, water is required for the solution. Though I had water in my inventory, this water was not acceptable to the game. At first, I thought I had encountered a glitch. I backed up to a save, and then another. I restarted my computer. But ultimately, it turned out that I needed water from different source. Unless I missed it, there was no explanation as to why that specific water was needed. In a game in which the lion’s share of the puzzles are logical, this illogical one stood out. Legend’s graphics are a mixed bag. 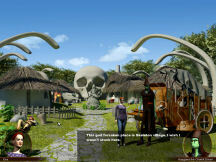 Sun-dappled trails lead to quaint villages decorated with huge skulls and lots of medieval-looking statues, which contrast sharply with the slick metallic buildings featuring advanced technology. Angular-faced fairy tale creatures exist alongside characters of a more fragile appearance. Grass movement is a bit stiff, while leaves fluttering on trees were fluid. I was particularly impressed by the shadows and the undulating water, but at times the camera angles drove me nuts. 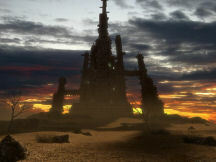 Though the winsome graphics are not technically dazzling, they provide a fitting setting for an intriguing story. 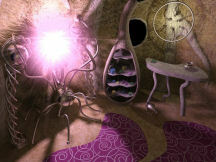 Small animations within some screens further draw your eye, and the numerous cut-scenes are well designed and implemented. All this exploring, interacting, and puzzle solving is accomplished while surrounded by beautifully soothing music and appropriate ambient sounds. Legend was stable on my machine. I experienced no glitches or crashes. 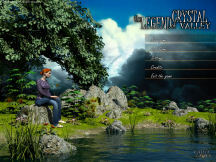 Legend of Crystal Valley is a charming game of beginnings and endings, of love and loss, creation and destruction, past and future, and possible vs. impossible. It allows the gamer to meander through a lovely setting accompanied by mellow music while uncovering a beguiling tale all the while solving puzzles which are both fun and fair. I particularly appreciated the varied control schemes available. Overall, this game was an entertaining experience. I think it would be a fantastic way to introduce someone to the world of adventure gaming, and yet it will also provide a restful experience to the veteran gamer. I bought the game from Big Fish Games, but it is also available at other download portals.